Yachid (יחיד) is the ultimate origin of the chasidim and the gevurot as they "exist" in Atzmut. This level corresponds to Atik Yomin in Jewish tradition and is the secret of the unhewn dolmen (הח) of ancient Celtic-Druid tradition. The unhewn dolmen is David's secret door to the mysteries behind closed doors, which is the gate - Sha'ar HaRachamim, and the power of a woman. The Jewish symbol for the sacred masculine force (הו) is the magen David. Like a 5 personality with a 4-wing (which I am, as well as being an INTJ), the two (feminine malchut - masculine keter) symbols unify (הדד <-> הח) and are woven together with 5 letters going to 4 letters (יחוד <-> החודה) through the secret of the unhewn dolmen. 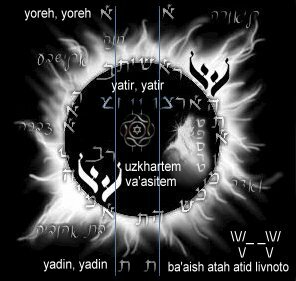 In the hands of Malchut (יי נט), through this INTJ (ינטי), is the power to unify two seemingly opposite manifestations of Divine Providence. It's a miracle of nature (נס הטבע) in the truest sense, with the power to transform & heal reality. This is the messianic spark in every Jewish soul, in my soul, as it journeys into life. And this is my story. Ba'aish atah atid livnoto. RaV Without Blemish. The first letter of written Torah is normally the letter beit. However, if this first beit falls (naphal) backs one space in the samech-cycle of Torah and becomes the last letter in sefer Devarim, the first letter of sefer Bereshit becomes reish, restoring clarity. 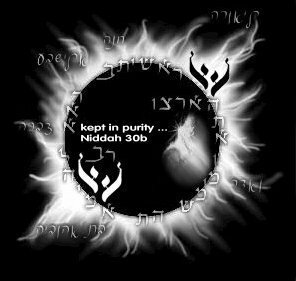 With clarity restored, through the samekh of the cycle, the power of the birchat kohanim and the power of semichah are also restored, clearly without blemish (מום). For באיש, with fire is it built [Bava Kama 60b]. 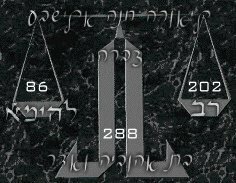 The beit that falls is rooted in ben, where ben represents the malchut of the ASMaB expansion of the tetragrammaton. 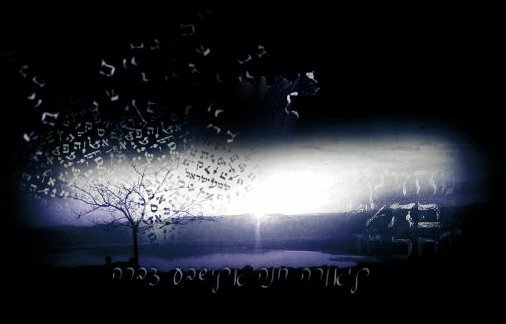 Having fallen, the new last letter of Devarim becomes beit. Together, the two letters - the new first letter of Bereshit (ר) and the new last letter of Devarim (ב), reading from Bereshit to Devarim (seder Chesed) spell the word RaV (רב) - and with this, I have made myself a RaV [Avot 1:16]. Even better than that, I have made a RaV without blemish. The Bird's Nest. This new configuration of Bereshit 1:1 describes my experience crossing the churning river of fire into existent consciousness. The initial experience of existent consciousness is called the bird's nest. The churning river of fire (nahar dinur) is also the shabbat river, the sambatyon. Redemptive Chesed. RaV (of seder Chesed) has a gematria of 202. Following the fall of the beit, through raising the letters of the Torah up one space, 202 sparks of holiness are also raised from the galut of mitzrayim. Tradition teaches us that each soul is born with a mission to redeem 288 fallen sparks of holiness entangled in and exiled throughout creation. 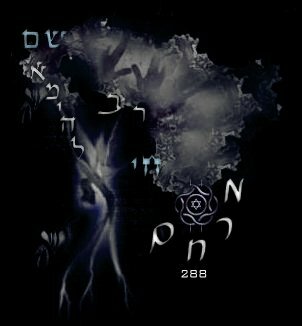 Of these 288 sparks, 202 of them are specifically associated with the exile of mitzrayim. Thus, within the first flicker of my soul's experience in creation, is the redemptive power to raise these sparks. Redemptive Gevurah. Having raised 202 sparks, 86 remain. Eighty-six is the gematria of Elo-him, Hashem's Name associated with creation, the sefirah Gevurah, the power to support and raise the fallen, and strict judgment. In the new RaV configuration of Bereshit 1:1 as written above, the Name Elo-him is transformed into the Name להימא . This Name also has a gematria of 86. Consequently, we can see that through this Name, להימא , the remaining 86 sparks scattered throughout creation are raised and redeemed. להימא is Holy Gevurah of Atzilut. Tikun HaTohu. Elo-him אל-הים is from the 3-letter root הים meaning agitate or creating confusion. Confusion and agitation are created by the mem sofit, which represents hidden wisdom. When wisdom is hidden from and access is closed to the mind, the mind lacks clarity. להימא opens up the mem and channels wisdom and clarity into the mind. This is the tikun of Elo-him in the world of Tohu, from which all the lower worlds (Beriyah, Yetzirah and Assiyah) are derived. Tikun HaBrit. Now, through להימא, the world of Tikun itself can be rectified and prepared to receive the great light of Tohu. Eighty-six is the gematria of the word וימל meaning "and he circumcised" [Bereshit 17:23]. This is the tikun of Elo-him in Beriyah. Tikun HaAf. Eighty-six is also the gematria of האף meaning "surely" [Bereshit 18:13], for surely have I remembered, and surely Sarah laughs with the Name להימא. Surely remembering and laughing at the absurdity of it all, anger, אף [Shemot 4:14] is transformed into a measure of remembrance equal to all the mitzvot of the Torah. This is the tikun of Elo-him in Yetzirah, the world of the letter vav. Tikun HaChemah, Sh'lim. With Elo-him and the world of Yetzirah rectified, the broken vav of shalom is restored to wholeness. Through restoration of vav, wrath חמה is transformed into a protecting wall, חומה. Shem Chai. Each person has a spark of Mashiach, one's living name, one's shem chai שם חי. With the 4 letters of shem chai and the following 4 expressions, the 4th side of the letter beit is closed, restoring the power of redemption to wholeness in all 4 worlds, and drawing it down into all existence. making a vessel fit for (my spark of) Mashiach.